Proven reeling solutions for YOUR Petroleum needs! 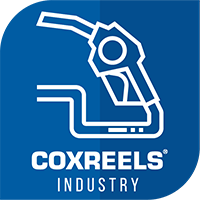 Coxreels® offers a wide array of heavy duty hose, cord, and cable reels to support your needs perfectly in the petroleum industry – which includes everything from exploration, extraction, refining, transportation (i.e. oil tankers or pipelines), and all the way to the end-user for refueling. 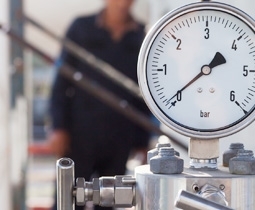 Whether your petroleum operation is on land, such as a refinery or pump site, or at sea, on an offshore oil platform, we have a variety of reels that can safely and efficiently transfer fuels and oil or grease products; as well as build and maintain the infrastructure for petroleum business & operations. 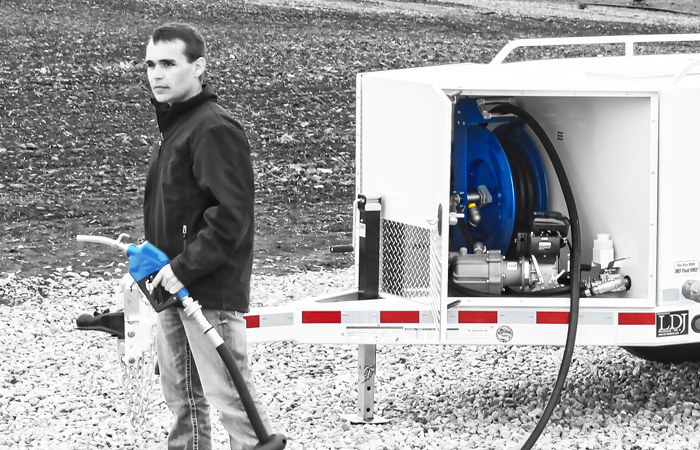 In addition, depending on your application, our fueling reels can come equipped with the right swivel for the job - such as solid brass 90º full-flow NPT swivel or Non-corrosive stainless steel 90º full-flow NPT swivel for DEF (diesel exhaust fluid), complete with Nitrile or Viton®seals. You demand durable & reliable equipment in the petroleum industry. You cannot expect less out of the reels you so heavily rely on. You need something built strong and Coxreels® delivers. Quality matters. Every time! *Please contact us if you need a custom engineered solution that is not in our main catalog. *Distributor information will be provided through your preferred method of contact. Click on the button to submit a request that will be routed to the appropriate distributor. 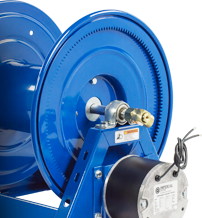 High Pressure Hose Reels, Lube Skid Reels, and more. Our reels are built strong. 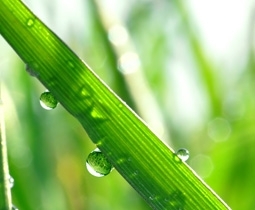 We proudly stand behind our reels with an industry-leading warranty. Eliminate whipping hazards at the worksite. Look for our patented Safety Rewind System on select spring rewind reels. With unparalleled craftsmanship right here in Tempe, Arizona. Our product line, which is made right here in the USA, leads the industry through performance, technology, and innovation. Some of the key features and benefits that make Coxreels industrial grade and the #1 choice for professionals include robust, steel-welded frames with heavy duty, spun ribbed discs and rolled edges – not stamped, made with first of its kind CNC robotic spinning cell. 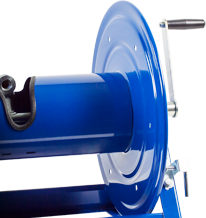 Exclusive low-profile outlet riser and open drum slot design for flat, smooth hose wrap found in our hand crank and motorized reels. Reliable, direct-gear, chainless drive on motor driven models provides quiet and smooth retraction. 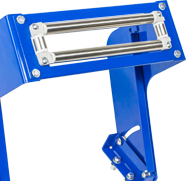 Choose from durable, industrial grade, brass swivels and stainless steel fluid path options. Permanently sealed, lubricated pillow block bearings for smooth rotation. 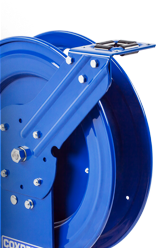 Durable proprietary CPC™ powder coat painted and corrosion resistant stainless steel reel variants available. 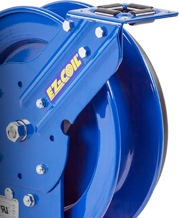 In addition, we offer controlled retraction speed in our spring driven reels, up to 80% slower, thanks to our patented EZ-Coil® Rewind Safety System (on select models) to dramatically increase workplace safety from whipping hazards. These are just some of the great features that differentiate Coxreels from the competition, delivering unparalleled durability and reliability in your reeling system!